Last week I mentioned how I use food as medicine to help relieve pain and heal. When you approach food from this perspective, food is more than just calories or something to silence a growling tummy. It is information that tells our cells what to do and how to react. Imagine your body is like a computer and everything you put into it is a command on the keyboard. With the right combination of key strokes the computer will perform a given function. In a similar way our bodies’ output directly depends on the input. Just like any other chemical substance you might put into your body – pharmaceuticals, over the counter drugs, other drugs, alcohol, etc. – the foods we eat create a chemical reaction just the same. And believe it or not, certain foods can have an effect that is just as strong, if not stronger, than one you can get from a bottle. Take turmeric for example. I talk a lot about this root here because it has incredible healing properties. And several studies have shown it to be as effective as Ibuprofen at relieving pain. So I add it to a variety of foods and dishes when I cook to give myself a regular does of its healing benefits. Turmeric: One of the most powerful medicinal herbs that has been used for centuries in Ayurvedic (ancient Indian) medicine to treat a variety of ailments including arthritis, bruises and wounds. It also aids protein digestion, decongests the liver, acts as an antioxidant and can reduce menstrual pain. Ginger: In addition to it’s anti-inflammatory, anti-viral and anti-bacterial properties, ginger is used to ease an upset stomach, reduce nausea, improve digestion, clear congestion and warm up the body. Cinnamon: Cinnamon can reduce inflammation, have antioxidant effects and fight bacteria. It’s been shown to help regulate blood sugar, reduce LDL cholesterol, and help with hormonal balance that can improve fertility. It’s also high in calcium, iron and manganese. Another way to bring down inflammation is to make sure you’re getting plenty of Omega-3 fatty acids daily. Omega-3s reduce inflammation and work to balance the abundance of the pro-inflammatory Omega-6 fatty acids we tend to get so much more of in our diet. When the ratio of Omega-3 to Omega-6 gets out of proportion and skews to the pro-inflammatory side, it lays the ground work for all sorts of problems from allergies to aches and pains to the more serious stuff. The key is to get plenty of Omega-3s from food and even supplements to maintain a proper balance. The hemp and flaxseed in this smoothie are two of the best plant-based sources of Omega-3 fatty acids. You can also get Omega-3s from salmon, walnuts and dark leafy greens. So there you have it, five (count ’em – five!) 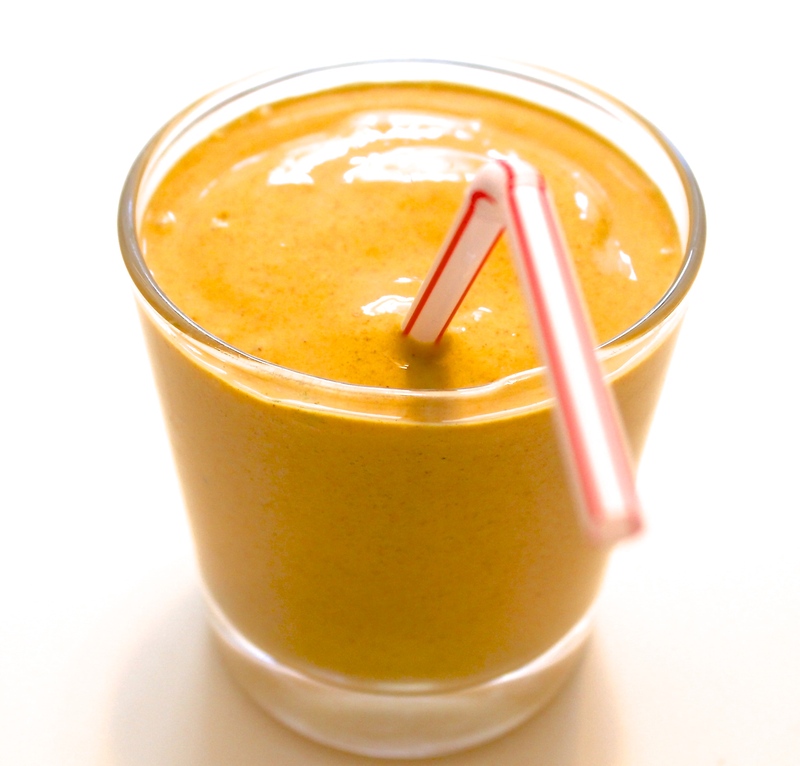 superfood inflammation fighters crammed into one glass. That’s a mega dose of anti-inflammatories to help kick your pain to the curb and boost your immunity. *black pepper is added to enhance the potency of turmeric and help it get into the bloodstream. A dash a black pepper enhances the benefits of turmeric 2,000 times. If the idea of using food as medicine intrigues you or if you’re curious about how you can start using food to feel better, I’d love to help. Last week I introduced my new program, No Pain, Everything to Gain: 90 Days to the Real You. This program is about making shifts so you naturally crave and want to eat good-for-you foods. We’ll work together to identify problem foods and replace those with ones that make it easy to make the necessary changes for you to feel your absolute best. We’ll look at the complete picture to help you manage all the areas of your life that can affect your well being including stress, physical activity and emotional health to give you a sturdy foundation for long-term health and healing. I’m offering five free 30 minute strategy sessions this week. If you’re interested in learning more about how small changes can make a big difference when it comes to dealing with chronic pain, email me at megan@meganadamsbrown.com. This is awesome! Just found your blog and can’t wait to use it as a resource. Thanks! I try to add a little tumeric and/or cinnamon to everything. Really helps with preventing inflammation when running! The coconut milk in a can or the kind that comes in half gallon size? Hi Anne, you can use either. Canned will be quite a bit thicker so if I go that route I usually cut it with water. Enjoy! !